This usually well-connected person criticizes the jobless for being lazy. But in a recent poll that asked if “the government in Washington should see to it that everyone who wants to work can find a job,” 68% of the general public agreed, while only 19% of the wealthy were in agreement. Apparently they feel the free market will find those jobs. But as they staunchly adhere to their notion, large corporations are holding trillions in cash, transferring millions of jobs overseas, and paying low-level wages to those who have managed to stay employed. The message being spread by the people at the top is that everyone benefits, and everyone has opportunities. The reality is that only the top of the mountain is flat. Or more accurately, the plateau just below the top of the mountain is flat. Perhaps 10% (or somewhere between 5% and 20%) of the U.S. is doing reasonably well, especially with 93% of non-home wealth owned by the richest quintile of Americans. Everyone else has experienced a 35-year decline in income. But hypocrisy bares its contemptuous soul with its hurrahs for the ever-growing stock market. Outside our borders, world inequality has decreased, but largely because of the rapid ascent of China, while INSIDE China inequality has grown at a pace rivaling the United States. There may be a half-billion young Chinese laborers who are technically above poverty level, but GDPs don’t measure the quality of life or asset distribution of 70-hour-per-week factory workers. Wealthy individuals pride themselves on their successes from meager beginnings. Many of this self-congratulatory group grew up as educated white males in the richest nation ever in the most productive time in the history of the world. They rode the technology engine for thirty years, benefiting from federal funding that provided almost half of basic research funds into the 1980s, and half of research in the communications industry as late as 1990. Now, of course, it’s much different. Globalization and automation have eliminated many of the old opportunities. Half of college graduates are unemployed or underemployed. And while it’s always been more of a struggle for the lowest-income people, it’s even worse now, withmore than half of those individuals in the bottom income quintile remaining there 10 years later. Compared to other developed countries, the U.S. ranks near the bottom in economic mobility. This candidate opposes government intervention of any type, unless it’s for national defense, homeland security, surveillance, prison funding and the drug war, any subsidies to oil and coal and agricultural companies, bailouts and Quantitative Easing, tax expenditures that mainly benefit the rich, and anything to do with women’s bodies. Here’s another candidate who hates government interference, but will tolerate it if there’s a friend in the regulator’s chair. A friend like Mary Jo White, connected for 36 years to a law firm that would be monitored by her new position as head of the SEC. General Electric has a particularly smooth-spinning revolving door in the back of its corporate offices. After eliminating 37,000 jobs over ten years, CEO Jeffery Immelt was appointed as chairman of President Obama’s Jobs Council. Secretary of Energy nominee Ernest Moniz has served on GE’s advisory board. And Cathy Koch, a lobbyist for the tax-avoiding company, was appointed chief advisor on tax and economic policy. Here are the facts. According to the Urban Institute the average two-earner couple making average wages throughout their lifetimes will receive less in Social Security benefits than they paid in. Same for single males. Meanwhile, tax expenditures (deductions and exemptions which primarily benefit the very rich) cost us about 8% of the GDP, which is almost exactly the same percentage that goes to Social Security and Medicare. Unlimited candidates for the Hypocrisy Hall here, starting with companies like Google and Microsoft that hold onto their foreign cash to avoid taxes, but actually keep the cash in U.S. banks, taking advantage of publicly-funded national security to safeguard the assets they’re not paying taxes on. Then there are pharmaceutical companies like Eli Lilly and Pfizer who denounce the idea of consumers purchasing cheap prescription drugs from Canada, but then shift patents and profits to offshore tax havens to avoid paying U.S. taxes. On the individual level, 1,700 Americans renounced their citizenships in 2011. 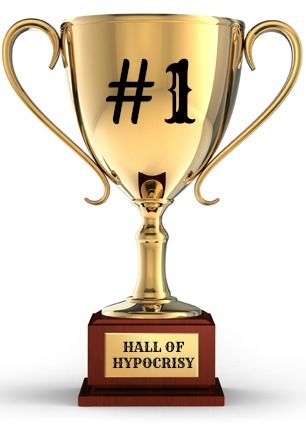 The top Hypocrisy Hall candidate is Eduardo Saverin, who found safe refuge in the U.S. after his family was threatened in Brazil, benefited from American research and technology to take billionsfrom his 4% share in Facebook, and then skipped out on his tax bill. What is the nature of GEO’s property? The 13th Amendment says “Neither slavery nor involuntary servitude, except as punishment for crime whereof the party shall have been duly convicted, shall exist within the United States.” The private prisons have a room ready for the kids on the school-to-prison pipeline. So Who Makes It to the Hall? Now, that is worthy of recognition.